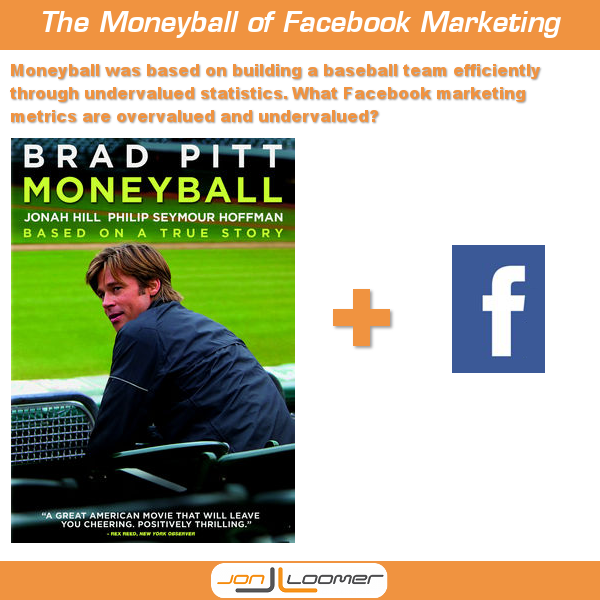 While at the AllFacebook.com Marketing Conference in New York City last week, Jeff Ferguson of Fang Digital spoke on a topic that made the entire trip worth it: He compared the flawed analysis of Facebook marketing statistics to the same practice in baseball. You have my attention, Jeff. I’m a huge baseball stats nerd. I’m not going to go into just how nerdy I am when it comes to the game of baseball, but just know that I gave my then 10-year-old son a project last year that included analyzing dozens of pages of career baseball statistics (minus the names) to determine which players deserved to be in the Hall of Fame. It should be no surprise that I’m also a bit of a Facebook marketing stats nerd. So when Jeff opened his session by talking about Moneyball and Bill James, a very large smile graced my face. In preparation for this session, Jeff wrote about this a month ago. I encourage you to read it. Jeff’s session was titled “The Great Lie of the ‘New’ Social Media Metrics.” His claim was that, just as baseball executives and scouts did for decades before Bill James came along, we’re completely blind to what metrics actually matter. Which Facebook marketing statistics are overrated and overused? Which fly under the radar and may actually hold the keys to success? I don’t have it figured out yet. But I want to use this blog post as inspiration to help continue the discussion that Jeff has started. I don’t want to get into a philosophical baseball debate here, but there are a half dozen statistics that I see as either hugely overrated or completely worthless. I’m going to focus on four. Error: Jeff already covered it, so I won’t belabor the point. Errors are only scored when a fielder is unable to make a play on a ball that you touch, and the official scorer deems that the play should have been made. If you make no attempt, you will not commit an error. Worthless. Yet too many baseball people still rate the “best” defenders based on this statistic, and it often is used as the main measure for worthiness of the Golden Glove awards. Win: This refers to the pitcher’s win. There was a time when a pitcher would go nine, 10 or 11 innings, and this held much more value. But even then, it was flawed. A starting pitcher is credited with a win if he throws at least five innings, his team has the lead when he leaves and his team retains the lead throughout the game. This is heavily reliant on his team scoring runs, his defense making plays and his bullpen holding that lead when he leaves the game (the “complete games” stat is now an endangered species). So many factors involved, yet until recently it was nearly impossible to take home your league’s Cy Young Award (given to the best pitcher) without winning 20 games or leading the league in the Wins stat. RBI: A Run Batted In is credited when your hit, walk or out (other than a double play) directly results in a run. You only truly earn this if you hit a home run, driving in yourself. But otherwise, the only way to earn an RBI is if there are runners on base. By nature, the leadoff hitter will come to the plate at least once every game without a runner on base. And since pitchers usually bat last in the National League, leadoff hitters will always get fewer opportunities to drive in runs after the first inning as well. You could put Babe Ruth in the leadoff position, and he would drive in far fewer runs. Would that make him a worse run producer? Like: Jeff’s said it. We spend too much time, money and effort worrying about this. We can cheat to inflate it. It’s always going to be quality over quantity. And if it’s low quality, it will negatively impact your EdgeRank. Yet, we often use number of Likes as the measure for determining the most influential Pages. Reach: You know I hate this metric. It’s imaginary. It can’t be proven. Whether my post reached 100 or 100,000 people, all I care about is what those people did. If in each case 10 people performed an action that resulted in a sale, is either audience truly more valuable? Talking About This: I’m referring to the Page Level type. Talking About This includes any action performed by Facebook users that resulted in a story. Sounds reasonable. But it includes simply Liking your Page. As a result, it’s not an accurate measure of people talking about your content. Yet, people often misunderstand it as being as much. And if you spend a lot of money on ads to get new Fans, this number will be insanely high without needing to produce a single piece of content. Negative Feedback: As with many overrated baseball stats, this isn’t completely worthless. It’s good to know when people hide your content or report you as spam. But the problem is that it’s inevitable if you produce content. I compare it to the strikeout (should have added it to the list!). A home run hitter will strike out a LOT. Some of the best hitters do. But the ability to quickly produce runs at a greater rate than other hitters makes them valuable. Yet, many baseball people still put far too much emphasis on how much a batter strikes out. Similarly, you will get negative feedback. As long as there is appropriate payoff (the Facebook marketing “home run”), it’s okay. Great. So we all know which stats are either overrated or completely worthless. So what should we focus on instead? OBP, WAR, BABIP, UZR, xFIP, etc. : I’m going to spare you here. There are a bunch of baseball stats you’ve likely never heard of that are infinitely more valuable than the stats I listed earlier. Engaged Users: I don’t care how many people I reached with my content. How many actually engaged with it? How many clicked anywhere within my post? This stat is far more valuable than Reach, yet it’s buried within export files. Engaged Fans: I often see people give percentages of engaged users over total Fans. It’s a completely flawed stat because the number of engaged users applies to non-Fans as well. Want to add value? Dig into those exports to find out how many of your FANS are actually engaging. This can also give you insight into how many non-Fans engage — which is also extremely valuable. Fan Stories: Engagement is nice. But what we really want is engagement that results in some sort of story. Here, I am focusing on Fan Stories for post level content so that it does not include Page Likes (post likes, comments and shares). Link Clicks: This may be more valuable for some than others. But it’s definitely valuable for publishers like me. Facebook is nice. But ultimately, I want to send users to my website. And since I share a TON of my own content (sue me! ), how much of it results in referrals? You can figure this out by measuring Link Clicks. Yep, it’s buried within those exports. Here’s the thing: I’m not convinced that any of these four stats necessarily hold the key to Facebook marketing. While there may be hundreds of different metrics available, Facebook often lacks in granularity. So, just like Bill James and his followers ended up creating their own stats, it may time for metrics to be added to the Facebook marketing toolbox. What stats do you consider the key to Facebook marketing success? Let me know in the comments below!